During June of this year, our family enjoyed its annual summer trip to the beach on Florida’s Amelia Island. It is always a fun time to be with Scott, Denise, and our grandchildren, Ian and Stirling. This year’s trip was no exception. Susan and I found time to drive over to Jacksonville one morning to visit once again the Robert Burns Memorial located in Confederate Park, a six-acre park operated by the city. We learned from Wikipedia that Jacksonville had hosted the annual reunion of United Confederate Veterans in 1914 and that an estimated 8,000 former Confederate soldiers attended. 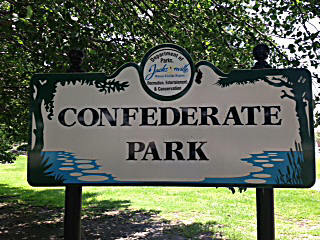 Hence, the name of the park. I have often wondered how many Scots have over the years driven past Exit 354 on I-95 not knowing they were just a mile from this 1930 tribute to Burns by the Robert Burns Association of Jacksonville. It is also sad, however, that the association is no longer in business. Just as sad is the fact that the memorial, sitting on a lovely plinth, is in desperate need of repair! What started our quest to visit this old dilapidated bust again were two articles that appeared in The Highlander magazine (issues January/February 2013 and May/June 2013). The first article attempted to list all the memorials to Burns in the United States. The second article was written by readers who pointed out those memorials in America that had not been identified. They noted that the Burns statue in Cheyenne, Wyoming, dedicated in 1928, was missing from the original article as was the Houston, Texas memorial which is only 12-15 years old. The Burns Club of Atlanta agreed to lend its bust of Burns to be used as a model for the Houston memorial. My friend, Jack Hume, made the trip to Atlanta in his car to pick it up. He then delivered it to a wonderful and delightful sculptor by the name of “Whisper” who produced a beautiful bust of Burns for the Houston park. 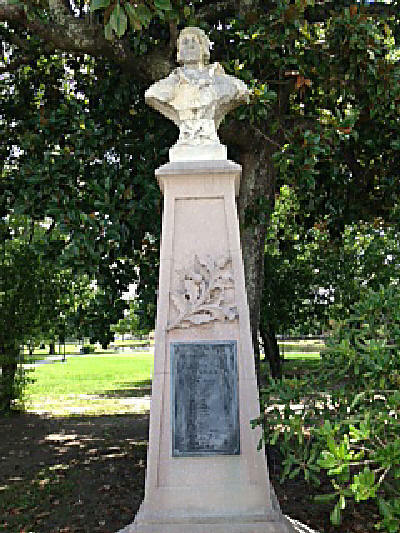 There may be other memorials in the United States I am unaware of, but I do know that the Jacksonville bust was not included in either of the articles in The Highlander and it is still on display in Jacksonville’s Confederate Park. Unfortunately when we arrived at the park we found the memorial of Burns continuing to deteriorate at a fast pace, and I immediately thought of the statue in Chicago. As the story goes, thieves paid a night visit to that statue years ago and stole the four panels from each side of the plinth to sell for scrap metal during World War II. Even though there is a very active Burns Club in Chicago that even supports a nursing facility, no one seems to be concerned enough to replace the panels, and sadly the same can be said for the Jacksonville bust. No one there seems to be interested in repairing their city’s memorial either. I can understand the problem in Jacksonville a little better though since there is no longer a Burns Club in the city. But may I suggest it would be a great project for the local St. Andrews Society to undertake. After all, it is a tribute to Robert Burns! I wrote two articles for Robert Burns Lives! (Chapters 71 and 72) in 2009 offering to help raise money to repair the Chicago statue. If any work has begun on that project, I hope someone will notify me as I know several people who would be willing to contribute to the cost of restoring the panels. The same goes for the Jacksonville memorial. The pages of Robert Burns Lives! can be used to help raise money for restoration of both tributes to Robert Burns. Below is a bit of information about the Jacksonville memorial. The memorial, by unknown sculptor, was dedicated August 27, 1930. The medal plaque on memorial states it was erected by the Robert Burns Association of Jacksonville and a list of past presidents is displayed. I quote from SIRIS ONLINE which says it is “a limestone bust of the poet Robert Burns atop a tall concrete shaft. The bust appears to be a likeness of the poet in his 20s or 30s. He is bear-headed and wears Victorian clothing, including a broad stand-up collar…” As to the sculptor, I imagine if the records of the old Burns Association could be found, so could the name of sculptor be unearthed. One can tell it was a beautiful memorial to our bard for many years but, like many of us, it has aged and needs a bit of touching up! The memorial to Burns is located near the corner of Main and Phelps Streets. It was surveyed in August, 1993 and the wording from the report simply says “Treatment Urgent”. That was 10 years ago and nothing has been done to restore the bust yet. Much of the damage is to the face of the bust, the weather having taken a mighty toll over the past 83 years. The park seemed well kept and visitors with their children and dogs in tow were enjoying a beautiful day at the park. Burns would love that as evidenced by the love for his dog, Luath. Killed by someone the night before his father died, the poet conferred immortality to Luath, his old and dear friend, in his 1872 poetical work, The Twa Dogs, A Tale (about Luath and Caesar). It is a shame that the bust in Jacksonville and the statue in Chicago both have been allowed to continue to deteriorate, but as offered earlier, I offer the help of this website to Burnsians in both cities to reach out for donations from anyone or any group willing to restore the two memorials. Editor’s Note: After I began this article and before completion, another letter was printed in The Highlander July/August 2013 issue telling a brief story of the Jacksonville memorial. The article was submitted by Avis Munro.